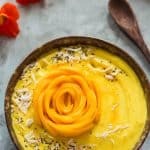 A Mango Smoothie Bowl is a fantastic way to start the day! 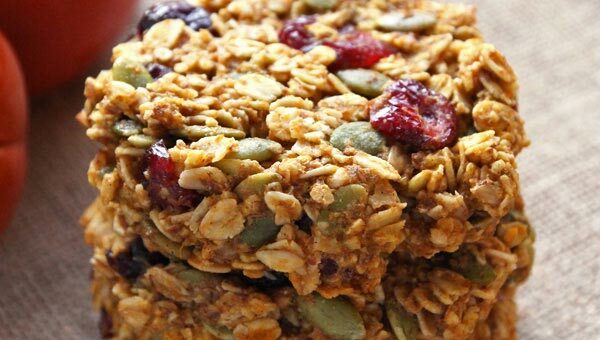 This recipe also makes a wonderful post-workout treat or healthy dessert. 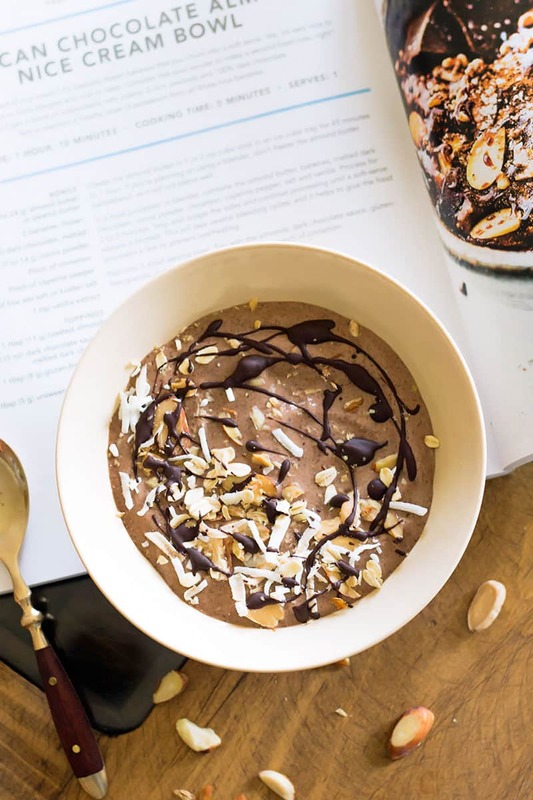 Today’s recipe is from Lindsay Cotter’s new cookbook Nourishing Superfood Bowls! You may know Lindsay’s amazing recipes from her blog CotterCrunch. I am super grateful that she sent me a review copy of her book – being able to flip through her stunning photography on printed pages is even better than seeing them on screen. 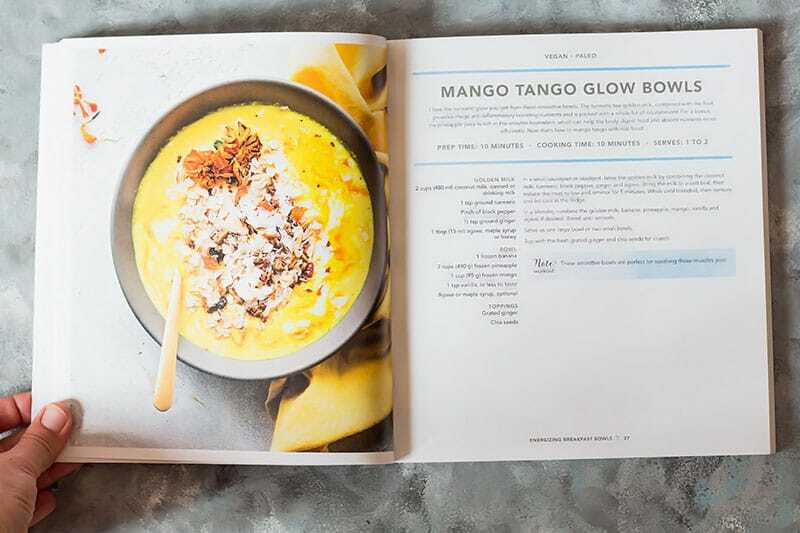 She also graciously allowed me to share this “Mango Tango Glow Bowl” recipe with all of you. AND she is even giving away a copy of the cookbook to one of you. Scroll down for the GIVEAWAY!! A smoothie bowl is a very thick smoothie. Instead of drinking it from a glass with a straw, it is filled into a bowl and eaten with a spoon. The advantage over a smoothie in cup is that you can add toppings to your heart’s desire. During my pregnancy and also for a time after I had texture issue with smoothies from a straw. That’s when I first discovered smoothie bowls. Thanks to the extra thick consistency and the abundance of toppings there was lots of texture contrast that made it possible for me to enjoy smoothies again. The key to an extra thick smoothie bowl consistency is using lots of frozen ingredients. You can use a blender, but you have to make sure it is a high speed blender. A weak blender will have lots of trouble with all the frozen ingredients. 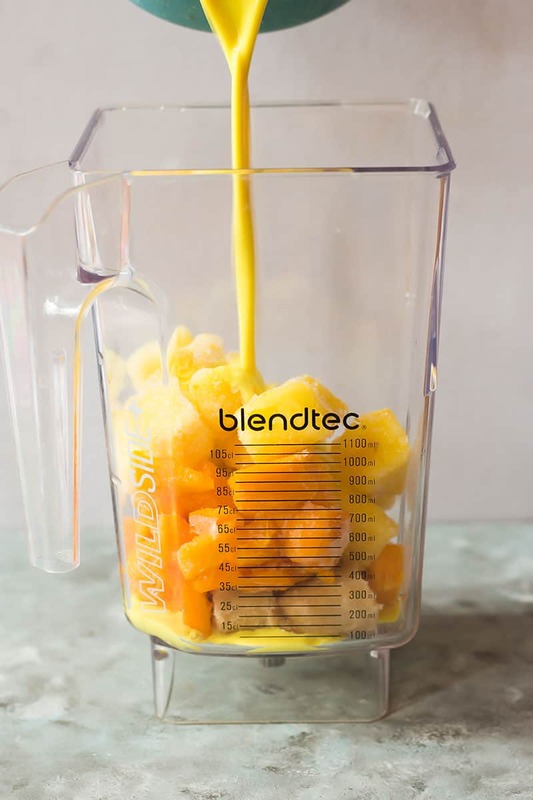 I used my Blendtec but would have preferred my Vitamix even more because it has a tamper. The tamper allows to push down the frozen ingredients continuously without needing to stop the blender. A food processor actually works surprisingly well for smoothie bowls as well. I am not a big fan of using a food processor for drinkable smoothies – especially when it involves leafy greens, I find they never get processed fine enough. But because of the icy consistency of the ingredients it’s almost like making nice cream – for which I always use my food processor. 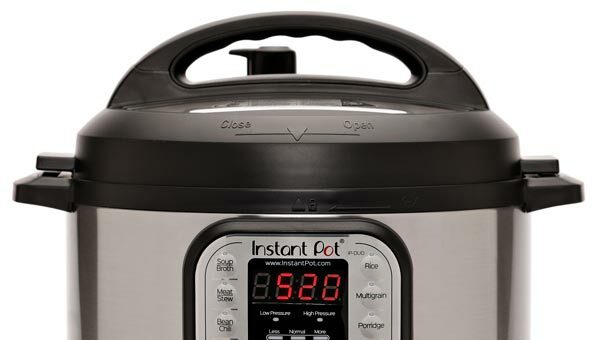 You may need to stop the food processor a couple of times to scrape down the sides, but it’s still a very easy process. 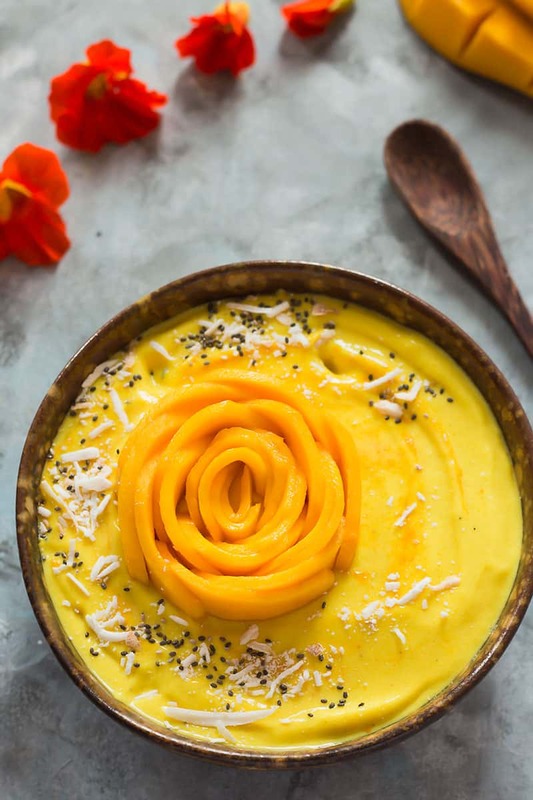 Making this pineapple mango smoothie bowl is as easy as adding all ingredients to a blender or food processor and turning it on. For easiest blending don’t follow my image above. Instead, add the liquid first and add the frozen fruit on top. 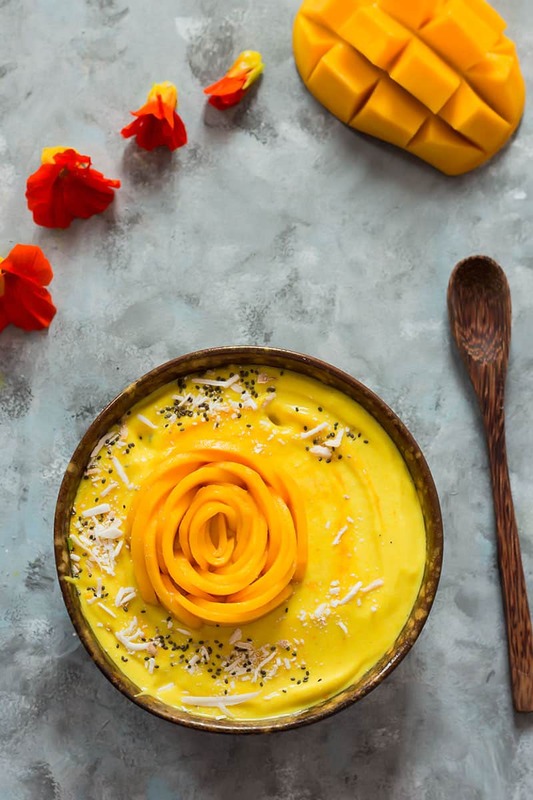 But before you get to this step you need to prepare the liquid component of this healthy mango smoothie bowl recipe. Which is a delicious soothing golden milk. 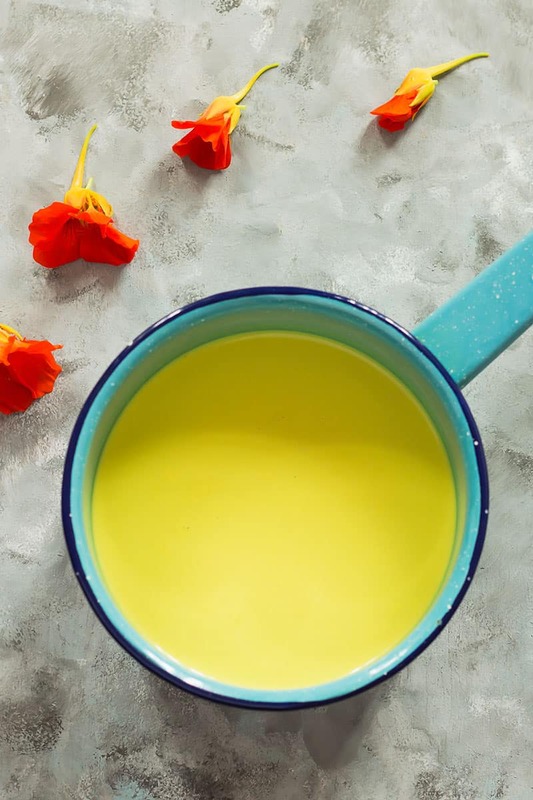 The golden milk is made from coconut milk that is heated together with spices – turmeric, ginger and black pepper. The mixture needs to simmer for about 5 minutes. Then let it cool at least to room temperature before using it in the banana mango smoothie bowl. I prepared my golden milk a day ahead and let it chill in the fridge overnight. 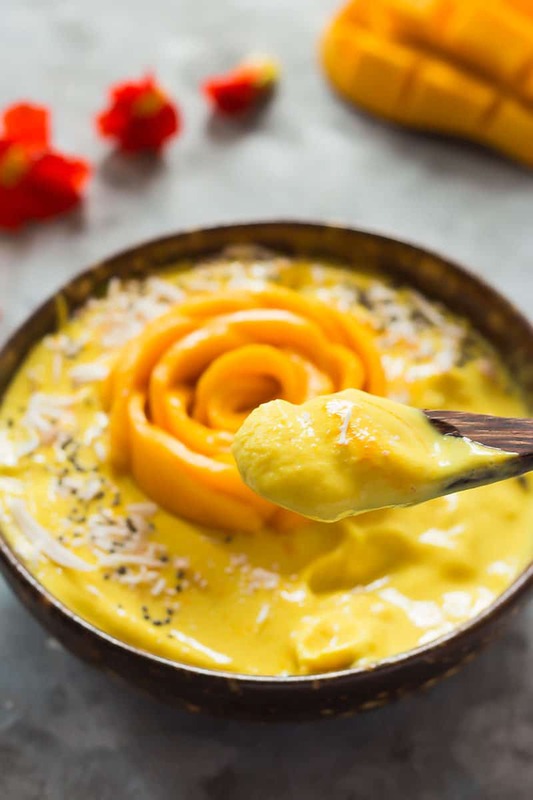 When you have blended up the mango smoothie fill it into 1-2 bowls and spread it out with a spoon to create a level surface. Now you can add any toppings you like. I made a mango rose from a thinly sliced peeled mango half – the process is the same as with an avocado rose. To that I added a sprinkle of turmeric powder, chia seeds and shredded coconut. 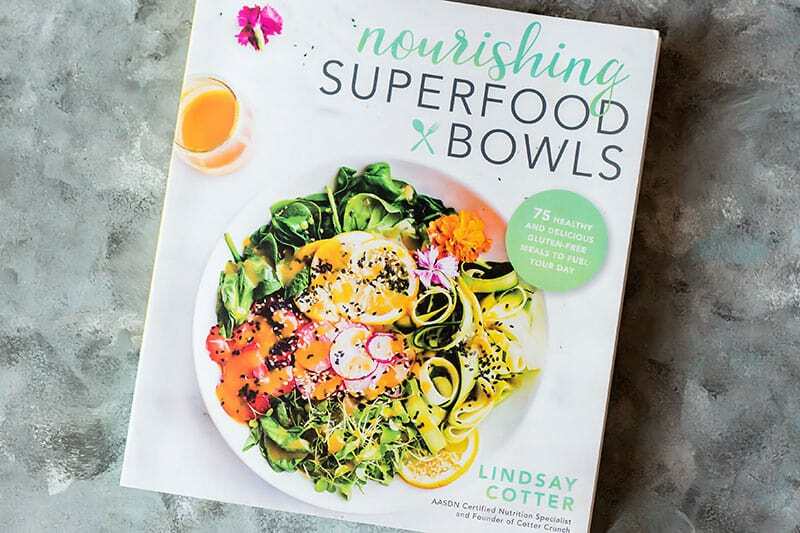 Now let’s talk about Lindsay’s amazing new cookbook: Nourishing Superfood Bowls! Nourishing Superfood Bowls is blowing me away in so many ways. It is divided into 5 awesome sections: breakfast bowls, lunch bowls, plant-based bowls, large family bowls, dessert bowls. And EVERY single recipe is accompanied by a stunning picture. Being a food blogger I have become very visual when it comes to recipes. So I am always disappointed when a printed cookbook includes images with only half of the recipes. But this cookbook doesn’t disappoint in this or any other way. 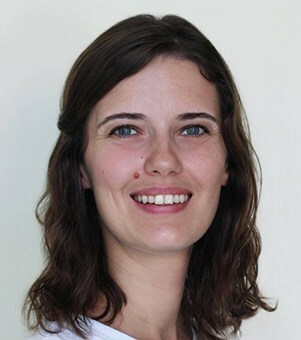 Lindsay is a AASDN certified nutrition specialist so every recipe also comes with an intro about the nutritional benefits of the superfoods used in each recipe. So we have made this Purple Power Smoothie Bowl which actually includes beets (!!) but you can’t taste it because of all the yummy berries in it as well. To satisfy my chocolate and nice cream loving heart I also made the Mexican Chocolate Almond Nice Cream Bowl from the dessert section for myself. It’s an absolute DREAM!! I am excited to delve into the savory bowl recipes next. The Thai Mango Noodle Salad Bowl is calling my name! So are the Curried Satay Veggie Bowl and the Shrimp Laksa Curry Bowl. Whisk until blended, then let the golden milk cool in the fridge. In a blender or food processor, combine the golden milk, banana, pineapple, mango, vanilla and agave if desired. Blend until smooth. Divide between serving bowls and top with chia seeds, shredded coconut or any other toppings you like. The recipes all look amazing! I can’t wait to have my own copy 🙂 I think I would first make the Kickin’ Orange Chicken and Broccali Rice Bowls. 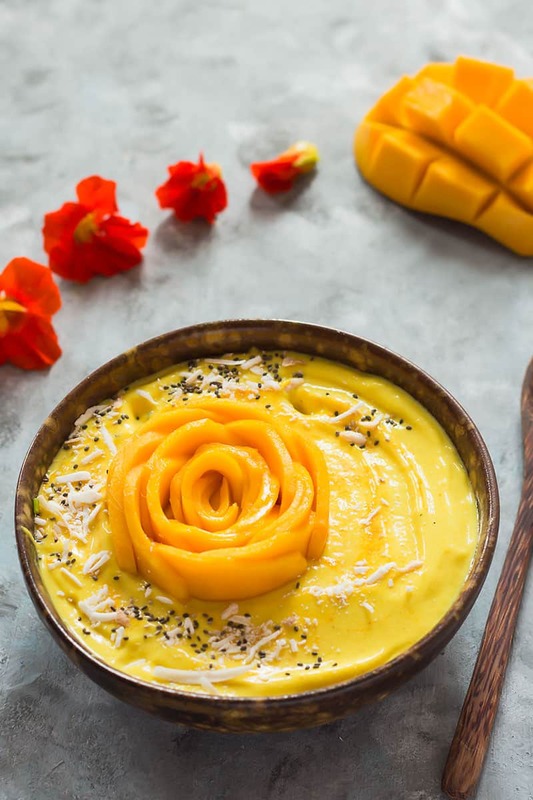 And I am definitely making this mango smoothie bowl soon! I’d make the tropical overnight muesli bowls. 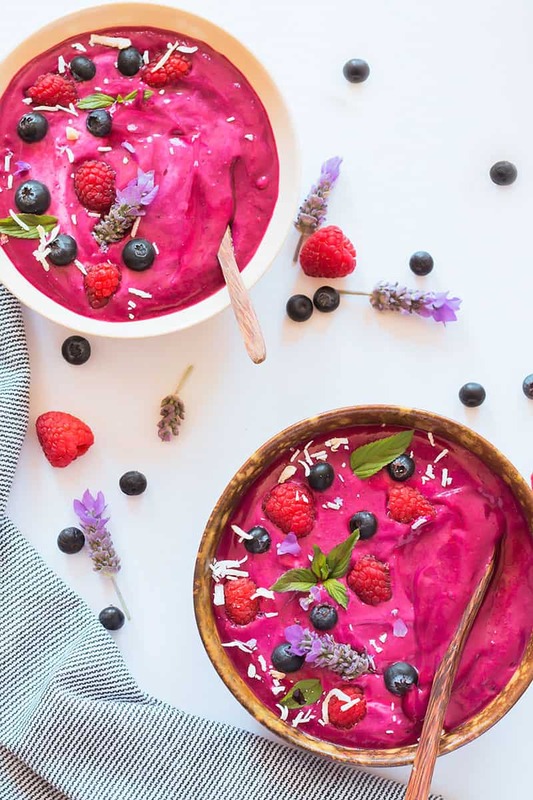 i would make Raspberry Sunrise Bowls- or the one you made, Purple Power Smoothie Bowl!! 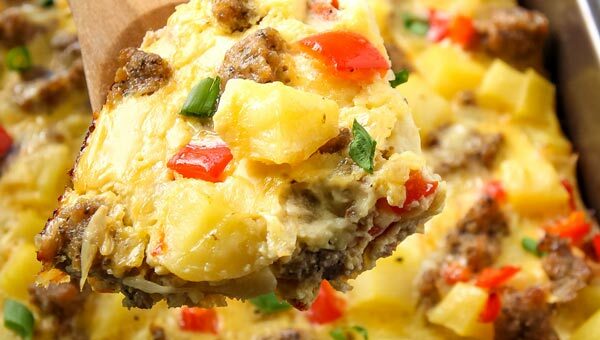 I would probably try either the Country Vegetable Scramble or Sweet Potato Nacho bowls. I love veggie bowls. Can’t wait to try the mango smoothie bowl. Sounds yummy. I would love to try the Healing Green Smoothie Bowls. I’m anxious to try the Mexican Chocolate Almond Nice Cream Bowl! Love the thick Mango Smoothies. 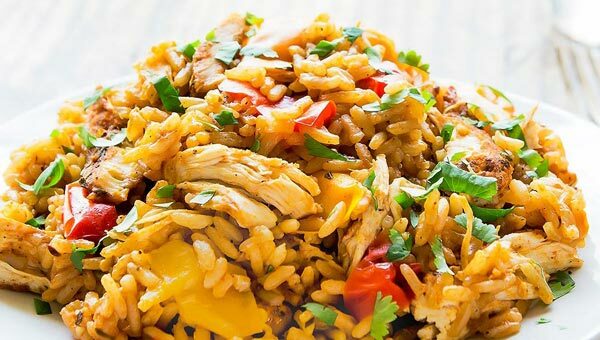 The Tex Mex Burrito Bowl is the first recipe I’d make. I’m going with the Creamy avocado Tuna Zoodle bowl sounds fantastic, but so many awesome recipes here! I would make the Raspberry Sunrise bowls. I would make the pumpkin chai latte bowl first.